An overnight cruise on the Milford Mariner is the ultimate dinner, bed and breakfast experience. 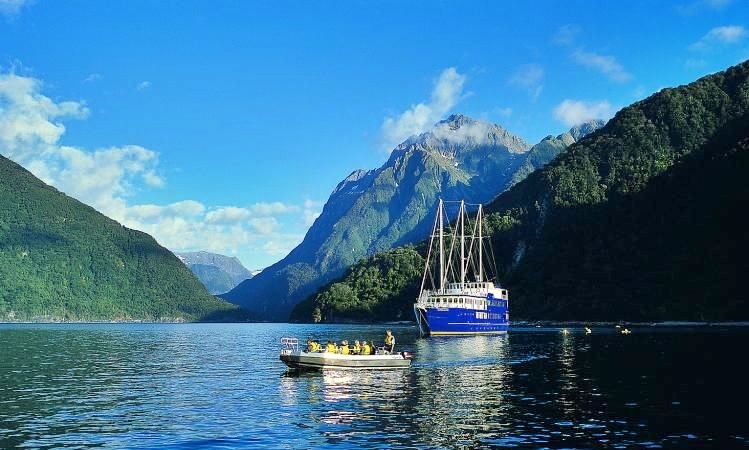 Depart from the Milford Sound wharf in the late afternoon and cruise the full length of Milford Sound to the Tasman Sea accompanied by a specialist nature guide. The cruise style is relaxed, allowing plenty of time to view the fiord’s spectacular waterfalls, rainforest, mountains and wildlife. The Milford Mariner then anchors in a sheltered cove, where you can join the nature guide and explore in the vessel’s tender craft (small boat) and kayaks. Or, if you prefer, you can simply relax on deck. As evening falls, enjoy a lavish carvery buffet in the dining saloon. Then relax in the company of fellow travellers or indulge in some star-gazing before retiring to your private cabin. Non-slip shoes/ boots, waterproof jacket, warm sweater/fleece jacket, change of clothes, sunscreen/sunglasses, insect repellent, swimwear (optional), camera, cash for bar and snacks. Overnight bag only.